I thought the day couldn’t get better. I’d just stepped off stage after interviewing Jessica Alba in front of a thousand people at Summit LA. Amazon CEO Jeff Bezos had been sitting in the first row. He came up to me as I walked off the stage to share what he thought of the session and I couldn’t have been happier. As soon as Bezos said goodbye, I met another person who would make a lasting impact on my life. “My name is Danielle Cohn,” she said. She introduced herself as the head of Comcast NBCUniversal LIFT Labs, which she explained, was a new entrepreneurial initiative to help startups navigate and do business with the company. We chatted briefly and she mentioned she would love to find a way to do something together during my book launch, so we exchanged information and parted ways. It wasn’t until a month later that I reconnected with Danielle over the phone and learned more about Comcast NBCUniversal LIFT Labs. The mission of LIFT Labs is to uplift and support entrepreneurs from across the globe – to give them the resources and community they need to achieve their dreams. I could feel how closely aligned my values are with Danielle’s, and with the program she’s building. At the time of our phone call, I was finishing up the final edits of The Third Door and I told Danielle I would send her an early copy when it was ready. Months later, when I finally had the early galleys of the book, I sent a few copies for Danielle and her team. With just a couple months until book launch, I had a call with Luke Butler from LIFT Labs and I could feel his excitement through the phone. We talked about how The Third Door is more than just a series of interviews with successful entrepreneurs – it’s a manifesto about the mindset all people need to achieve their dreams. I asked if Comcast NBCUniversal LIFT Labs would be the title sponsor of The Third Door Book Tour. We set expectations, got the paperwork ready – and just in time – the agreement was signed one day before book launch. From there, the partnership soared. 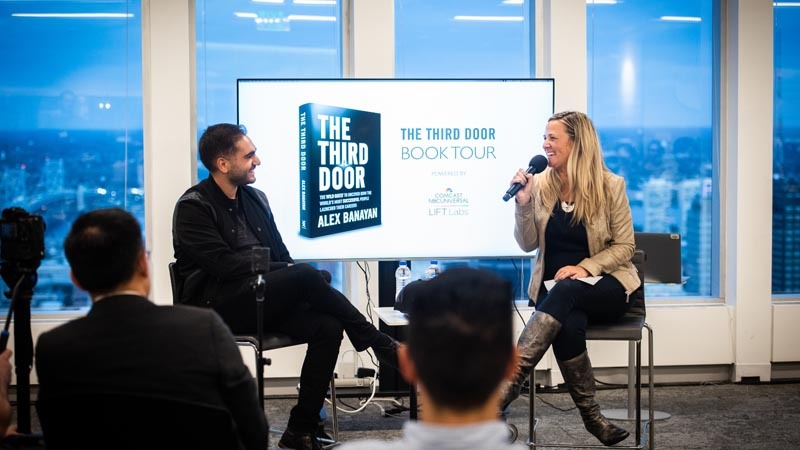 The Third Door Book Tour has visited Google, Snapchat, Salesforce, and dozens of more companies and tech conferences that make up the larger entrepreneurial ecosystem in America. At every event, the Comcast NBCUniversal LIFT Labs has been displayed behind me and I couldn’t be happier. Just last month I visited Philadelphia, stepping into the Comcast NBCUniversal LIFT Labs headquarters for the first time to do a keynote and book signing. I could feel the entrepreneurial energy the second I walked in the door. The event was sold out! And the room – with its 48th floor view of Philadelphia’s impressive skyline – was filled with entrepreneurs from the city’s startup community, and young professionals from Comcast NBCUniversal eager to hear about my experiences. They asked intriguing questions, shared their thoughts on success, and offered a warm and friendly welcome. And in some ways, after months on the road for the book tour, being there felt like I was coming home. I think a lot of people underestimate the first step in the process. Whether it’s a marriage, a book tour sponsor, or finding a co-founder for your startup, a strong partnership only works if you start off with the same set of values. What do you believe in? What do you care about? Only then can you start envisioning the future together. The Third Door’s partnership with Comcast NBCUniversal LIFT Labs worked better than I could have imagined, and I wouldn’t have wanted it any other way. Stay up-to-date on the latest LIFT Labs news. Sign up to receive our monthly email and follow us on Twitter!